What Is the Difference Between Transportation and Logistics? Home » Blog » What Is the Difference Between Transportation and Logistics? Logistics is the overseeing of both the inward and outward flow of goods from the manufacturing point to the end user or point of use. The movement of these goods is known as transportation. While some use these terms interchangeably, they are two very unique aspects of the supply chain. Here’s what you need to know about logistics vs. transportation. 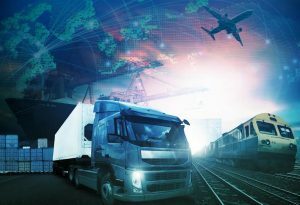 The logistics services industry is defined as the obtaining, producing, and distributing of materials and products in the right quantities to an end user or final destination. It includes the science of planning, implementing, and managing procedures for the most efficient and effective storage and transportation of goods as possible. Services and related information from the source point to the consumer is sent through logistics to fulfill and meet customer demands. The movement of people, goods, and animals from one location to another by air, rail, road, sea, cable, space, or pipeline is known as transportation. Transportation services are divided into three aspects: infrastructure, vehicles, and operations. Transportation is very important because it allows communication and trade between two parties. Although both transportation and logistics deal with getting valuables from one location to another, logistics has added benefits and functions. Logistics executives also have to make decisions dealing with packaging, containerization, documentation, insurance, storage, importing and exporting regulations, freight damage claims, working and collaborating, managing vendors and partners, and risk mitigation. Even though these terms have been used as a substation for each other, the key differentiators are that logistics deals with the integration of storage, transportation, cataloguing, handling, and packaging of goods while transportation deals with the function of moving products or individuals from one location to the next. Working with a third-party logistics team can streamline these multiple roles within your supply chain. Whether you are a small or medium-sized business, you can benefit from outsourcing the bulk of your logistics operations to us. It can be a tricky task to focus on marketing and sales, your website, and advertising, along with the multiple aspects of the supply chain. This is where Cannon Hill Logistics comes in. Our professionals will provide the solutions you need. We provide our clients with a wide range of services including physical inventory counts, quality control and inspection of goods, returns processing, promotional pricing, custom inventory reports, and more. We specialize in outsourced wholesale and retail product distribution, fulfillment, and logistic services based out of Frederick, MD. For over 30 years we have worked hard to make sure our customers are getting the most out of their operations and that their processes are streamlined and effective. If you need advice as to what inventory management solution is best for you, or if you want to work with us, please contact us at 1-(800) 822-4747.